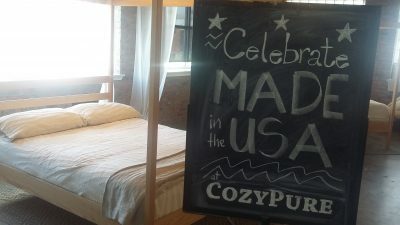 In observance of the holiday, CozyPure kicked off our annual Made in the USA sale during the 4th of July weekend. For the last couple of weeks we’ve had orders pouring in for natural latex mattresses, Made in America linens and handcrafted pillows and blankets. Customers love this sale because they can save money on their favorite CozyPure products, we love this sale because it is the perfect time for us to remind consumers that their order is made fresh daily in our Norfolk, VA workshop. 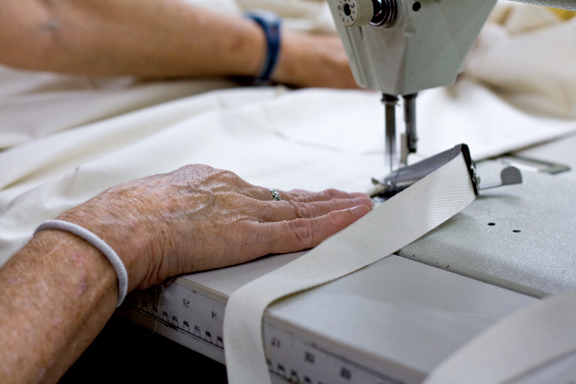 We’ve always been committed to using sustainable and organic materials, but we’re also dedicated to USA manufacturing. In fact, the entire CozyPure® brand of products proudly carries the Made in the USA label. CozyPure® is one of the American manufacturing companies featured on the ABC World News Tonight “Made in America” list. CozyPure’s Made in the USA sale is continuing through the end of July. 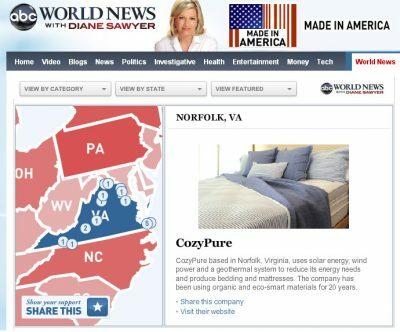 Shop online at www.CozyPure.com, via phone at 1-800-229-7571 or in our Norfolk, VA showroom. Now that we’ve established that CozyPure’s latex mattresses and organic bedding is all made right here in the good ol’ U. S. of A., our next article will delve deeper in to the “making” of latex mattresses. You deserve to know what’s inside and we’ve never been afraid to tell you!